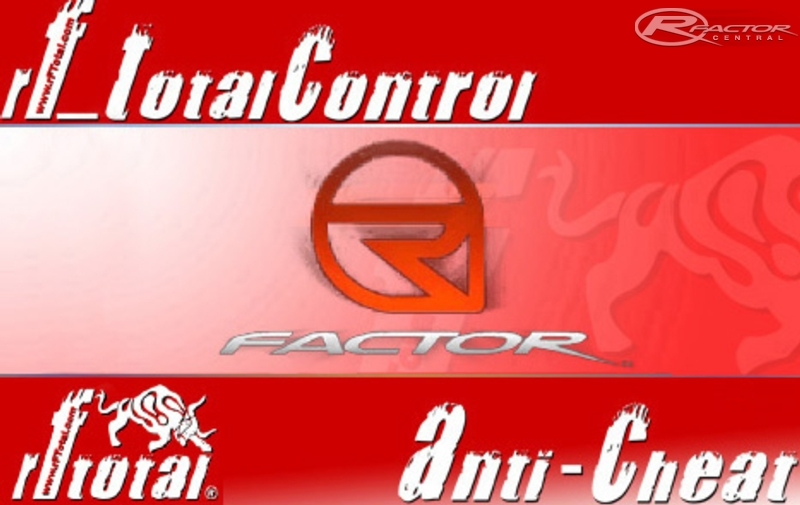 We present you our latest creation, rF_TotalControl, Anti Cheat definitive tool for rFactor. RF_TotalControl system makes three basic functions for a total guarantee of fairness and transparency in online competitions for the simulator rFactor. On the one hand, collects telemetry data from the Driver race, thanks to the fantastic plugin MotecPlugin by Lazza, which we openly thanks for your great work. These data can be easily checked and analyzed, without having to read complicated scripts, using the templates you have here available for use with MoTeC i2 Pro software that you can download from the website of MoTeC for free (http://www.motec.com/i2/i2downloads/). Using these templates you can check all kinds of data such as vehicle weight, tires, track and ambient temperatures, wear and temperatures, fuel consumption ... to the most unbelievable race issues of each driver in a very intuitive graphical environment. Even accessing the details of telemetry (CTRL+D) you can see what file .tbc has used by the Driver. On the other hand the rF_TotalControl system generates a text file with extension .chk, which you can read using the Windows Notepad, to have accurate information about plugins used by rfactor, home directory rfactor and rF_TotalControl, and also a list of processes that Windows has loaded into memory. Finally, the novelty of the rF_TotalControl system is its ability to analyze real-time PC memory of the Driver looking for of all known software with the ability to alter the competition, such as Ram Cheat, Cheat Engine or rFactor Trainer among others. If a Driver uses any tool, resident in memory, that serves to alter the competition, the system rF_TotalControl immediately expel him from the race and sent, to the chosen email address, the necessary evidence for the correct identification of the Driver and the tool used. The rF_TotalControl system is the only software that provides this function, this is why its use is a total guarantee of a fair competition. You must install rF_TotalControl in the same directory that stores a copy of rFactor you use for competition. Once installed the system rF_TotalControl, the Driver must configure by selecting the name of the driver in rFactor with which will run the race and entering the email address to which to send the data after the race. This email address must be provided by the event organizers, league or race in question. In this same configuration screen, the Driver can, if desired, to increase or decrease the waiting time between the execution of rfHighVoltage and rFactor. 1. - when the driver leaves rFactor, the sending data screen will be displayed. 2. - You must press the "send" button and select the telemetry file with. Ld extension, corresponding to the race session. This file can be found in the /UserData/LOG/rF_TotalControl /, as shown in the popup window that appears to select the file. The telemetry file is sorted by the name of the circuit, the session type, date and time. For convenience we recommend clicking on the "View" button, select "Details" and sort all files by date, so it will be very easy to find the last file created. 3. - Write a short comment, if the Driver likes. The system rF_TotalControl updates automatically, notifying the user about new versions and downloading them directly from www.rFTotal.com servers. In future versions we will correcting and enhancing its functionalities. just didst think to give the race versions a different setting then street version. No se puede descargar, podrian decirnos como hacerlo, gracias. Can't download. Logged in on site. Thanck you , very, very, very much!